In his long-awaited report to the Victorian Government on Melbourne’s “East West Link Needs Assessment”, Sir Rod Eddington has issued a clear and urgent warning. “One message came through loudly, clearly and constantly during the EWLNA consultations: do something,” the report says. More costly, less efficient freight movements will result, the report continues. “Unless action is taken to manage Melbourne’s rapidly growing freight task more efficiently, significantly higher costs will be incurred by business in moving goods around the city, as well as nationally and internationally. Sir Eddington made 20 recommendations in his report, of which the following concern freight specifically. These are summarised below. Community amenity in the inner west should be restored by implementing a Truck Action Plan to remove truck traffic from local streets in the inner west. The plan should include a series of targeted road improvements that form an effective bypass around residential areas, reinforced by local truck bans. The Victorian Government should re-evaluate its 30/2010 rail target (which aims to move 30 per cent of freight from and to all Victorian ports by rail by 2010), given the clear finding by the EWLNA that it cannot be met. The Government should create a new strategy and work with industry to develop and implement a detailed action plan for moving more freight by rail. • Ensuring the development of a single, common user, interstate, intermodal freight terminal north of the city on the Melbourne to Sydney rail corridor. • Developing the standard gauge rail freight network to connect the interstate intermodal terminal with the key metropolitan freight hubs. • Making and announcing concrete planning decisions about the future sites for metropolitan freight hubs. • Ensuring that all future transport plans build in the connection of the Port of Hastings to the interstate standard gauge rail network. 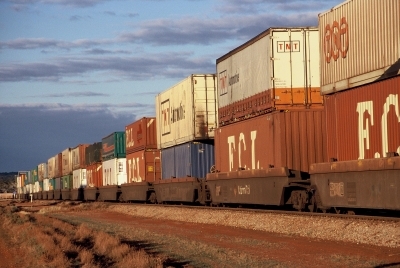 The Port of Melbourne Corporation should be given overall responsibility for implementing an intermodal hub network in Melbourne, including responsibility for achieving the Government’s revised rail freight target. Given the projected increase in the metropolitan freight task, the Government should take further action to improve the efficient movement of road freight by permitting the introduction of high productivity freight vehicles on designated routes. The Victorian Government should seek early discussions with the Commonwealth Government regarding a funding contribution from AusLink towards some or all of the EWLNA recommended projects. The Government should also work with the Commonwealth to extend AusLink to transport projects designed to relieve urban congestion. The 96-page summary report can be downloaded here.